Gheorghe Hagi is considered to be the greatest Romanian soccer player of all time. Hagi is also credited for putting Romania on the global front page as a soccer playing country to be reckoned with and for producing top class players. He is affectionately referred to as the ‘Regele’ known as the King or ‘Comandante’ which translates to the Commander. Hagi is a legend not only in Romania but in the world of sports as well. For many he is the complete embodiment of Romanian soccer and for some the country itself. He lifted the spirits of the Romanians during dark times due to its political turmoil and instability with his magnificent soccer style and goals. Hagi made the world see Romania is more than just a dark horse. 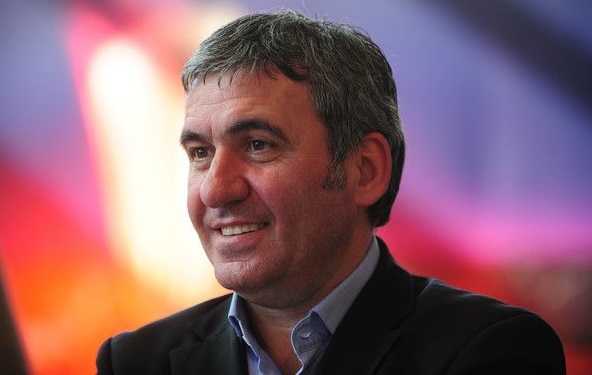 Today Hagi is the owner and chairman of the Romanian club Viitorul Constanta and has established the Gheorghe Hagi Football Academy in his home town; it is the biggest soccer academy in all of South-eastern Europe. Hagi’s outstanding 17 year old international career consists of three World Cups, as well as playing for giant European clubs like Barcelona, Real Madrid and Galatasaray. Hagi was born in 1965 in Sacele, Romania into a family of into a Latin speaking family of Aromanian descent. The initial teenaged years were spent playing for various youth clubs before being selected by the Romanian Football Federation to join the Bucuresti for two years. By the age of 18 Hagi opted to join a better established soccer team in the form of Bucharest. The next six years saw Hagi lead his clubs to European Cup semi-final and final and winning three Romanian Championships back to back. After the world cup of 1990 Hagi joined Real Madrid and then later shifted to Brescia. The often mercurial Hagi was the heart of his Romanian national team, he was often caught getting into arguments with referees and managers but so strong was his dedication to the national side that his team always followed his lead. Hagi’s creativity as a soccer player is what set him apart from other players; he possessed a strong technique and vision and was known for his superb passes and finishes. He left other players, commentators and the crowd transfixed by his sheer brilliance. It was the 1994 World Cup which really put Hagi on the map is a bona fide soccer legend. In Romania’s first match Hagi’s legendary lob from the wide on the left wing clinched Romania a 3-1 win over Colombia – a result no one was expecting. This goal is now considered to be one of the greatest goals in the history of soccer. Romania’s next match in the world cup was also a thriller where the under dog team beat hot favourites Argentina 3-2. Hagi represented Romania in three World Cups and three European Championships. Hagi has been named Romanian Footballer of the Year seven times, and is regarded as one of the best football players of his generation. In 2003 he was selected as the Golden Player of Romania and was named by the Romanian Football Federation as their most outstanding player of the past 50 years. FIFA named Hagi as one of the 125 Greatest Living Footballers in 2004.